Lately the kids have been really interested in storytelling, reading, writing and drawing. The dramatic play area and writing center are where the kids spend most of the day engaged in some pretty vivid imaginary adventures. By the end of the day I find myself picking up several abandoned sheets of paper scattered around the room or carefully stacked up on the stairs in neat little nameless piles. Great writers and story tellers have very vivid imaginations that are developed through LOTS of opportunities for unstructured, open- ended play. As the children play together, they experiment with scene setting, developing plots and examining themes of justice and ethics. Lots of conflicts arise both real and imaginary; as the children work through the problems they encounter, an order to their collective storytelling emerges. These little paper stacks are covered in scribbles that represent the day’s storytelling, book discussions, attempts at writing actual words or shared ideas scrawled out in technicolor awesomeness. If it were possible to decode the beautiful multi colored scribbles of the wees, you would find a rich fantasy landscape filled with superheroes, dark villains and beautiful princesses dancing among the colorful loops. These guys worked for two or three days with a simple wooden frame, pieces of fabric, clothes pins and princesses to create a story in which the princesses were constantly falling into the ocean and needing to be rescued. The boys used bits of string and clips to create ropes to attach to the girls so they could pull them up on land. They also made boats from wooden bowls for the princesses to escape pirates, sharks and an evil sea witch. If those magical markings could talk you would know the children are beginning to jot down their understanding of mysteries of the unseen organs in their bodies; they want to know how poop is made, where thoughts are thought up or how babies eat inside their mommy’s uterus when you can’t even get any bottles in there. L chimes in and they all discuss different ways to get to their houses. 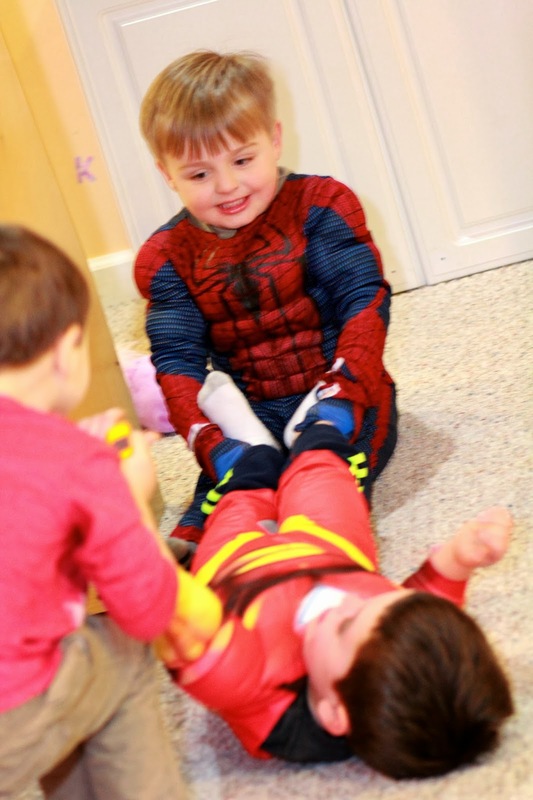 They each describe attributes of their homes and the wonderful toys they have; that discussion leads to another discussion about getting together to have a playdate. They’re also asking lots thought provoking questions, sharing interesting ideas and collaborating among themselves in order to develop some very complex ideas based on their shared experiences. I could write for days about all the wonderful things they think up in any given day or how those thoughts determine the trajectory of our daily discoveries but it’s the kind of thing you have to actually witness to appreciate in full depth. In a feeble attempt to capture some of the secrets lurking in the preschooler scribbles, I have started a formal journaling activity with the children. Each child has his or her very own journal where they can record ideas centered on a topic of discussion that stems from one of our free play experiences, book discussions or writing center activities. There are very few rules to the activity, I only ask that the children be thoughtful in their attempts at writing and that they stay on topic. L is telling us all a very animated story about what he imagines to be in Morris's disappearing bag: a train track that leads to the north pole. A has been drawing all day. She doesn't have much to say as she draws circles of many different sizes all over her paper. I ask her what she thinks is in Morris's bag and she says "Circles.... for construction." I try to get her to elaborate but she's much too busy focusing on her work to answer so I leave her to filling out her fourth sheet of paper covered in tiny circles. It seems she is much more interested in replicating the tiny letters she sees in the book than contemplating the possibilities that lay inside Morris's bag. If they choose to make large, fast scribbles without regard to the act of writing or if they would rather write about something unrelated to our group subject, I offer them the opportunity to work separately with a regular piece of paper instead of the writing in their journal. The purpose in setting guidelines to the project is to convey the idea that there should be some rudimentary structure to the act of writing. My intention is to help them understand that the idea behind journaling is to get their thoughts out on paper so that they can see what they are thinking in order to organize and expand their ideas. 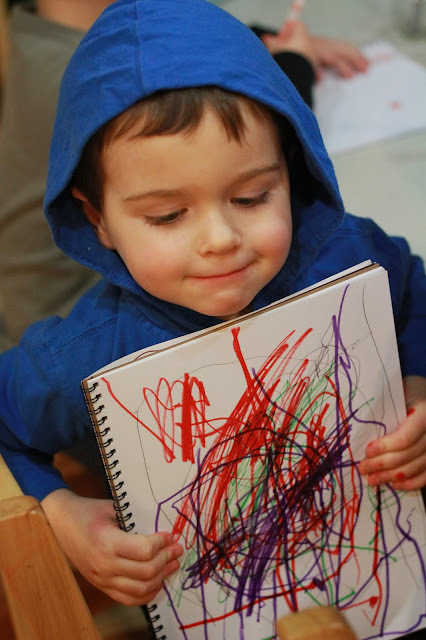 While the preschoolers writing still looks like scribbles, the way they write is much more deliberate. As they talk there is some relation between the momentum of their movements, the direction of the lines they draw and an elevated level of thoughtfulness behind the things they write in their journals. As they write, I record some of their ideas and stories. Playing the part of reporter is tricky for me because I would much rather be talking to the kids, learning what they know and listening to the world as they see it. Instead I am working to write very quickly as all six of them are shouting ideas, musings or bits of stories to each other. W proudly showing his journal work for the day, he worked for well over forty minutes on generating his ideas. My intention in recording their thoughts is to send them the message that their thoughts are worthy of other people’s attention, more importantly their thoughts are worthy of their own attention and that they should take the time to think about the things they read, imagine or wonder about. Journaling time is a time to learn to question, organize, collaborate, share and defend their ideas in a meaningful way so that they can develop the skills to be proficient in the ability to express themselves.